HIHP-10044 or HIHP-10045 – Fitting Source Inc. This compact air pressure amplifier unit includes model 3A-SS-2.5 or 3A-SS-4 and it is a complete pneumatic system designed to provide 2.5x or 4x the available plant air pressure. Tank is approximately 1-gallon, D.O.T. code steel bottle. 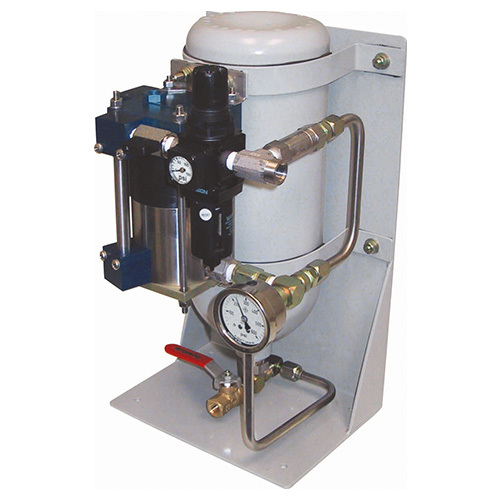 The inlet drive air regulator is provided to control the output pressure up to 675-PSI (46.6 BAR). Primary Applications: Assist smaller air powered tools and machines with marginal shop air pressure. Ideal for light duty, miscellaneous testing, and boosting into tight spaces.